Moonbeam: Look what my baby gave me! Look what my baby gave me! I love my baby. This was such a sweet, wonderful treat to receive before February even started! 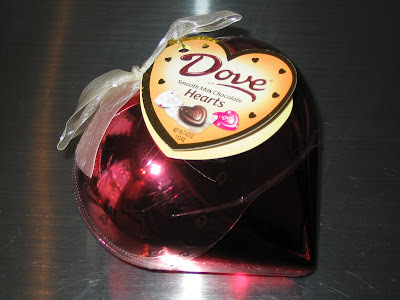 Plus, I love Dove chocolate. 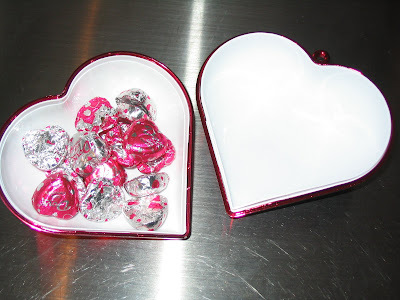 The shiny heart reminds me of care bears :) It's such a satisfying color, size & shape. And here's the good stuff...yum. I'm surprised there is any left at all. We have been a bit sugared out these past few days, what with banana pudding, cookies, ice cream AND chocolate filled hearts. Gotta love Valentine's Day!